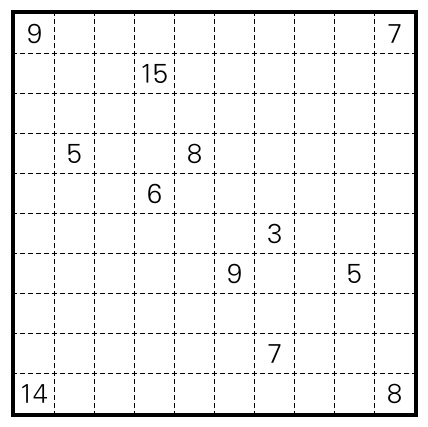 Here’s a puzzle I made quite a while back, I believe the type was on some Sudoku GP round. It’s more puzzle than sudoku. I’m not sure the “different digits” constraint is required to make this one unique, but it should help. 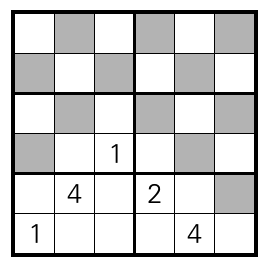 Rules Solve as a standard sudoku. In addition, subdivide the grid into rectangles, such that each rectangle contains exactly one shaded cell, and such that the number in that cell is equal to the area of the rectangle. Rectangles must not contain any digit more than once. This entry was posted in Puzzles and tagged shikaku, sudoku, sukaku, variant on 2016-02-10 by rob.